It seems ‘normal’ to me to begin an illustration with a piece of paper on which I transfer a sketch and then begin to draw and paint. When I’m done, I have my finished illustration. So, the thought of constructing all the tiny parts and pieces of a picture and assembling them in a wooden stage/frame to be meticulously lit and photographed is quite a fascinating undertaking to me. 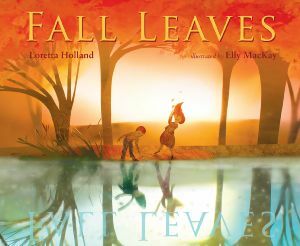 “Fall Leaves” published by Houghton Mifflin Harcourt, written by Loretta Holland and illustrated by Elly MacKay took my breath away. Each page turn has large header type and is wordplay with homonyms, “Leaves leave… Temperature falls… Fall Leaves”. There is a small paragraph narrating the changing of the seasons with some interesting nature trivia and observations. 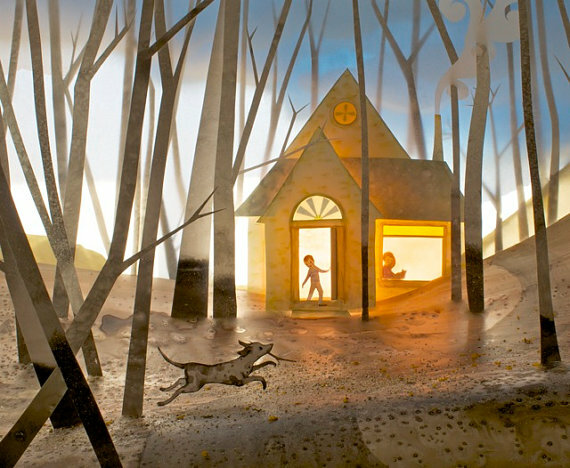 But what ties everything together for me are Elly MacKay’s magical illustrations. They make the book a feast for the senses. One wants to just crawl into the page, it’s such a believable world she creates. There’s something otherworldly about Elly’s artwork. 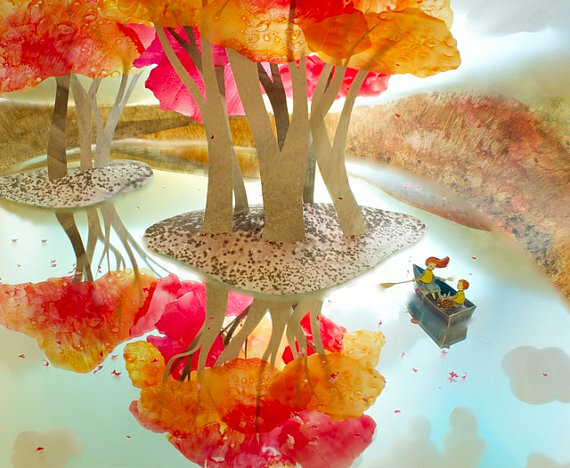 Her technique is to build ‘sets’ out of paper creating a three dimensional space, then light them in a way that gives an ethereal effect and photograph them. 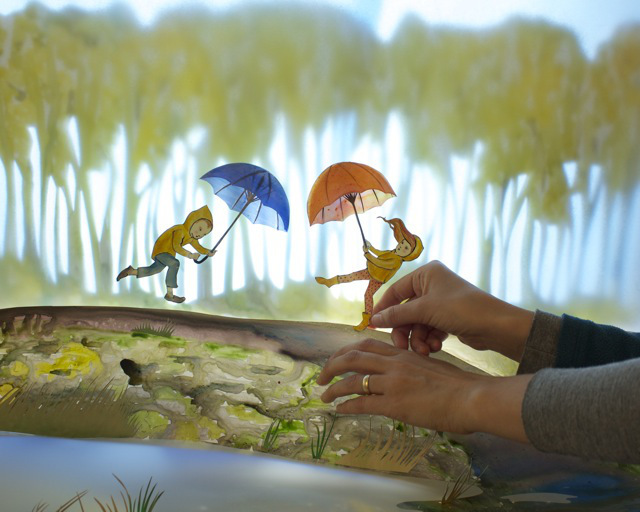 Elly uses Yupo paper (a synthetic watercolor paper) that she paints, cuts out, and assembles. I contacted Elly to ask her how long it takes her to make a completed image and she said that she completes about 2 per week, working about 6 hours a day. Elly has a very successful etsy shop (where I first saw and admired her images several years ago) at theaterclouds.etsy.com. Constructing and photographing theaters for one’s illustrations certainly requires a varied skill set. “Fall Leaves” is a captivating book and I thoroughly enjoyed learning more about Elly’s unique and intriguing illustration process, hope you did, too! Elly Mackay, Fall Leaves, illustration, Jennifer Black Reinhardt. Bookmark. I know, Donna! They’re amazing! Thanks for reading and commenting! 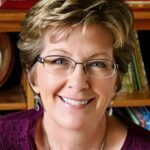 Thank you for such a wonderful article. Incredible pictures too. Very inspiring – so much so that I think we should get creative with this approach in our next book. Thank you for visiting, Jamie. I think Elly’s illustrations are so unique and special. I’m glad you enjoyed them, too! Wow!! 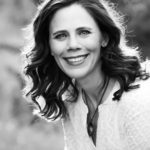 What a unique approach with a gorgeous outcome — this leaves me very inspired. Thanks for sharing, Jennifer! Hi Eliza, it does make one think ‘off the page’ a bit doesn’t it? Thanks! WOW. These are jaw-dropping! 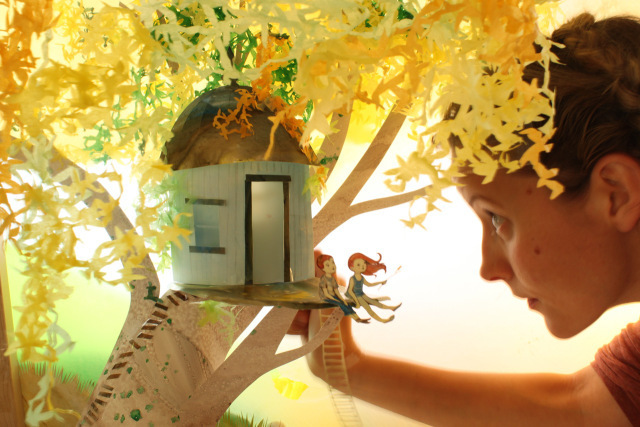 The way she uses light and shows wind movement with her cutouts … incredible. Hi Elly, You know that people who love picture books are a lovely lot! Thank you for visiting and for creating and sharing your gorgeous artwork with us! I saw your work in a magazine, Canadian Living or Chatelaine maybe? So engaging and perfect. And I bet you have fun doing it (most of the time)! This title just went on my must get list. The illustrations are inspirational. Thanks for sharing. Wow! Truly lovely illustrations. Her process reminds of the way that Disney Studios did their layered animations for films like Sleeping Beauty and Snow White. Yes, Patricia, building all those layers upon layers… thanks for stopping by! Stunning. Everything a children’s illustration should be and beyond. This is breathtaking illustration! I would love to have a text that could live up to this kind of beauty. Many thanks for sharing this! Thanks for all your comments, I do think Elly’s stunning illustrations are a perfect match to Loretta Holland’s poetic wordplay. Hope you all enjoy the book as much as I did! Oh, wow. I’ve got to check out this book — AND Elly’s Etsy’s shop. Amazing! Thanks, Jennifer! Hi Linda, yes take a trip to etsy— all her images are magical and beautiful! so amazingly beautiful…i need to get this book for my collection! thanks for sharing. Thank you fr sharing this woman’s magic. It is such a treat! Thank you all for visiting and taking the time to comment. I hope Elly stops back and reads all your lovely compliments! WOW! …is all I can come up with. Thank you for your post – it opened my eyes to the intricacies of illustrations. 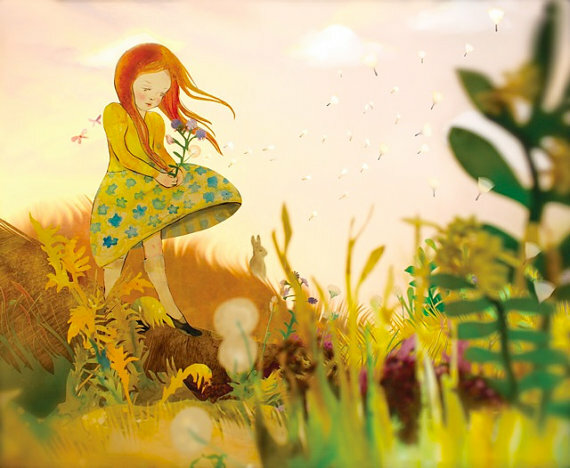 Elly MacKay’s are absolutely amazing! Wow! Wow! Wow! Thanks for sharing this. Elly’s work is, indeed stunning and her process is so unique. Thank you for visiting our blog!